As legal cannabis markets emerge across the country, HBO’s “High Maintenance,” reminds us all of a simpler time. A time when buying weed on America’s favorite black market didn’t involve security guards, bud-tenders and corporate owners. It was a time when The Guy — an anonymous fella with a bike and a backpack full of goodies — was all you needed. “High Maintenance” is a show that features The Guy, but it’s not about him. It’s a show about people — people from every background you can imagine living life as it comes at them. The only thing they have in common is an interaction with The Guy, played authentically by co-creator Ben Sinclair. The characters profiled change in each episode, although some briefly reappear in small interactions with The Guy. Most are his clients, who meet their bearded pot dealer in their New York City apartments to review his offerings and enjoy his company. Even for first-time buyers, The Guy is a friend to everyone who needs him. Other characters aren’t looking for drugs of any kind and simply cross paths with The Guy at random. One episode in the new season features Raymond, a young boy who is home from school and spends the day at the cafe where his mother works. Wallowing in his own boredom, Raymond buzzes around the cafe informing customers about where to find the bathroom code, the heirloom tomatoes on their sandwiches and where to locate napkins and extra silverware when he’s doesn’t insist on fetching it for them. After his mother yells at him to sit down and stop bothering customers, The Guy wanders into the cafe for lunch. “Did you hear the good news?” Raymond asks The Guy, who is preoccupied with his soup. In the season premiere, The Guy attends a friend’s funeral. The episode follows a mutual friend as she copes with the loss. Without much of a traditional plot to follow, it’s these somewhat odd interactions that make the show so captivating. All that the show reveals about each character occurs in the few hours before, during and after their interaction with The Guy, making the show as unpredictable as television can be. The situations the characters find themselves in are also as diverse as the characters themselves. Some are having idyllic weekends at home with friends and family, while others confront the most difficult moments in their lives. The show sells itself as a comedy, and it often is. But some episodes strike a more melancholic tone. 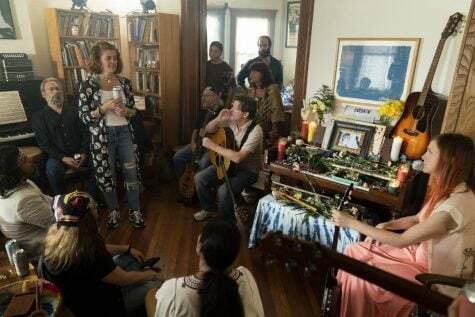 The season three premiere begins with the death of a friend of The Guy and follows Cori, a mutual friend and roommate of the deceased character, as she copes with his loss. These dark and uncomfortable moments are balanced artfully by The Guy’s laid-back, stoner-esque demeanor and stunning cinematography. Many of the scenes have little dialogue — often hosting a lone actor — to allow the camera to take over, capturing unique angles, detail shots and beautiful use of natural light that gives each episode an uplifting feeling. The Guy talks with a child named Raymond in a cafe. “High Maintenance’s” third season is yet another improvement on a show that has seen rave reviews since it made the jump from web series to HBO. The writing improves each season, the characters become more interesting and the cinematography more striking. Whether you smoke weed or not, “High Maintenance” will capture your attention and pique your curiosity. “High Maintenance” airs new episodes Sunday nights on HBO.